I love love love eggs. So, I’m well practiced at soft boiling, scrambling, and making sunny side up and over easy eggs. I even stir fry and steam them in Chinese dishes (recipes in the Asian – Other Asian Foods category). But I never poach them. So when I watched Anne Burrell poach eggs on the Food Network, I figured it was about time that I learned this technique. So I did some research online and pooled together some tips for poaching eggs. I was very excited to learn (from Anne Burrell) that poached eggs can be made ahead of time. Apparently, restaurants do this all the time. So you could easily make several batches of these one day in advance if you’re having guests over for brunch or dinner. 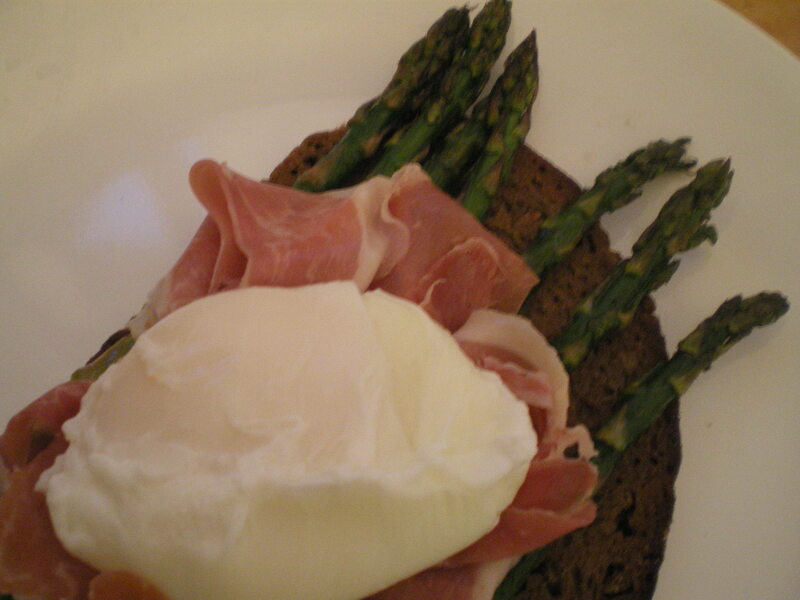 Pictures above: From my Poached Eggs with Asparagus, Prosciutto and Hollandaise Recipe here. Fill a bowl with cold tap water and several ice cubes. This will be the ice bath for the eggs after they have been poached. Keep the bowl near the stove. Fill a medium saucepan with water so that you have a depth of 4 inches of water. Many recipes require only 2 or 3 inches of water, and although your eggs will cook just fine in any depth of water, your poached eggs will not look as pretty. If the water is too shallow, the egg whites will sink with the yolk and your egg will look more like a sunny side up egg. If the water is too deep, the egg white will float and separate from the yolk. With 4 inches of water (as suggested by Chef Robert Danhi), you should get a pretty egg white pouch surrounding the yolk. Add the white vinegar and salt and bring to a boil. Reduce the heat until you only have tiny bubbles in the water. Meanwhile, gently crack each egg into separate bowls. Then, holding the bowl as close to the surface of the water as possible, very gently drop the egg into the water. Cook the eggs for 3 to 4 minutes. When done the whites will be cooked through and the yolks will be warm but still liquid. Remove the egg white trails. If you are serving the eggs right away: using a slotted spoon, remove the eggs from the saucepan, blot on some paper towel to remove the excess water and place on the serving plate. If making the eggs ahead of time: using a slotted spoon, remove the eggs from the saucepan and place in the bowl of cold water. Store in the refrigerator, covered, for up to 24 hours. Before serving, bring a pot of salted water to a boil. Reduce the heat until you only have tiny bubbles (or none at all) in the water. 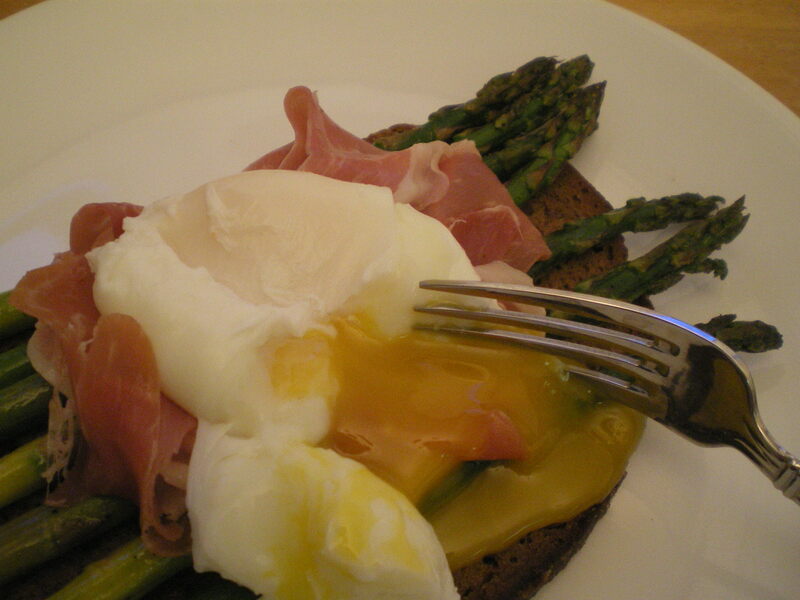 Carefully drop the poached eggs into the water using a slotted spoon to reheat slightly for 1 to 2 minutes. Use a slotted spoon to remove the eggs from the saucepan. Blot on some paper towel to remove the excess water and then place on the serving plate. If you are making the eggs ahead of time, they need to sit in the ice water in the fridge? Would’t the eggs be very watery? Thanks! Hi Sarah! Yes, they would stay in the water. I haven’t tried this personally, it was Chef Anne Burrell from Food Network that said restaurants do this all the time. As long as your egg isn’t enveloped within itself and not containing any holes, I think it should be fine. If you try it, let me know how it works! Thanks!